In the soft darkness of early morning, no pink yet showing in the East, the alarm rings. 6am. It’s still dark because the year is waning and the dark hangs on longer in the mornings and creeps in earlier in the evenings. I nudge my husband to get him awake enough to turn off that infernal beeping that has interrupted my blissful, warm sleep. I snuggle back down with a sigh as the noise stops, seeking a few more minutes of slumber before the cacophony of the day intrudes for good. I love this time of year. The crisp air, the warm sunshine, the crunch of leaves, the smell of harvest in the air. Sweatshirts, hot drinks, fuzzy socks, and a touch of the button on the thermostat to bring warm air circulating through the house. Warm lamplight to break the early morning darkness as the day starts. 7:50 am and I head out the door with my teen, delivering her to school for another day of ‘higher learning’. If I don’t have my coffee with me I’ll swing by the local coffee shop and get a breve. Back home I encourage my other two girls to get to their own school studies. On a really organized day I take time to toss a few things in the crock pot and switch it on low to simmer all day and deliver a delicious meal at dinner time. As the meal begins to cook, I toss a load of laundry in the washer, give the bathroom a quick straighten, peek in on the school girls, and head to my work room to see how much I can accomplish before time to head out again to pick up the teenager. Occasionally I’m interrupted by a girl needing a bit of help with math. Or reading. Or English. And needing a bit more encouragement to keep at the school work to get finished on time. I work on pillows for my wholesale business that has grown to proportions I never imagined. I check Facebook. Answer another school question. Reply to a text from a client. Laundry gets switched to the dryer (most days anyway). I might squeeze in some time to work on new designs I’ve got swirling in my head just begging to be created. We breeze through lunch with girls normally fixing their own. I try to make sure they take care of dishes right away, but many days this slips through the cracks and doesn’t happen till almost dinner time. Dinner. Oh yes, it’s in the crockpot. Hallelujah. Cause it’s almost that time and I’m still working away. School pick-up happened, schoolwork finished for the day and everyone is off enjoying the weather or entertaining themselves somehow. 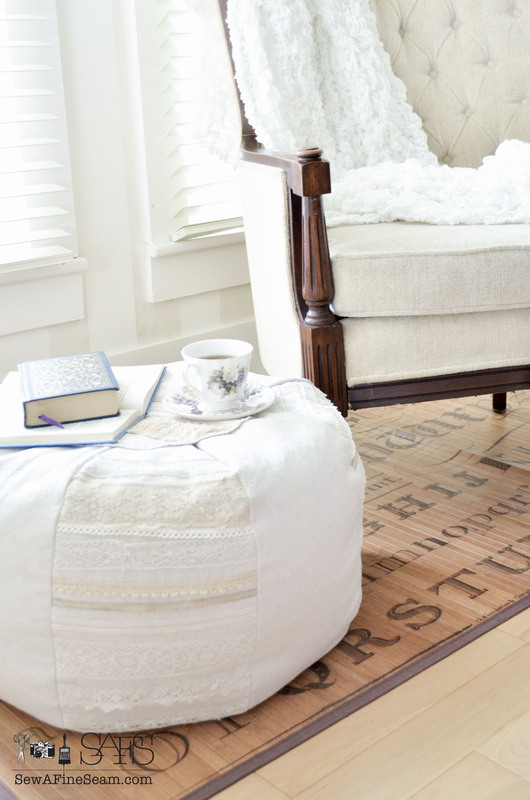 How about an easy, wonderful way to create a special end to the day? Why wait for a birthday or holiday? Let’s make TODAY special! And what is more special than adding a pie to a meal! 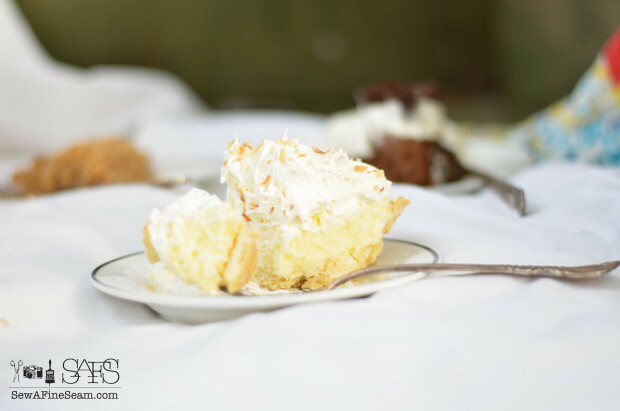 A pie with homemade quality and made-from-scratch crust that you can have in the oven in minutes – all you have to do is pull it out of the freezer, plop it on a cookie sheet and bake at 400° for an hour or so. 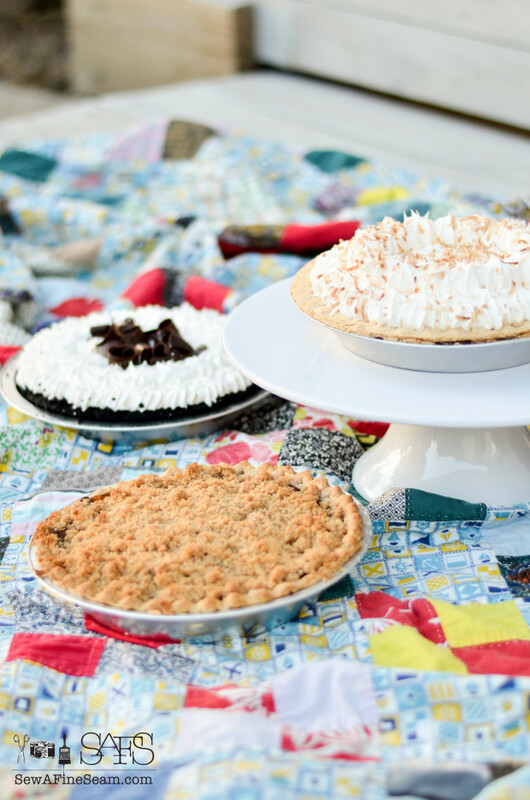 Marie Callender’s pies add that special touch that celebrates the day. 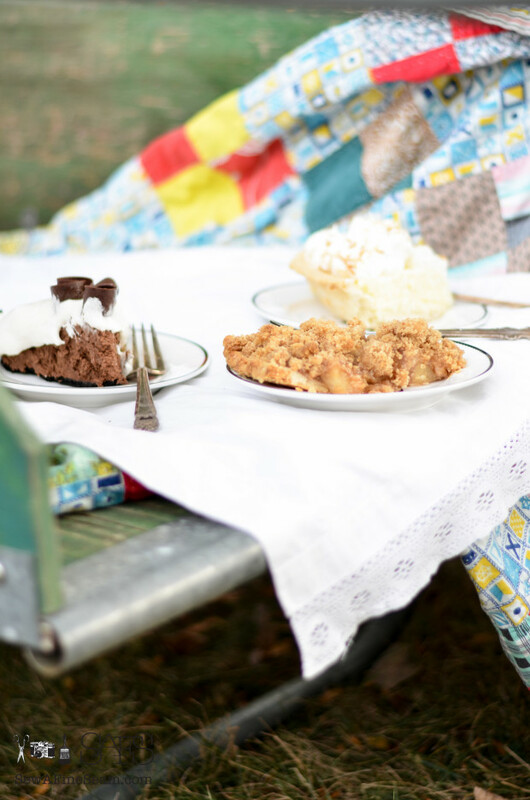 From the made-from-scratch crust to the wholesome fuji apples used in the Dutch Apple to the real chocolate curls on the Chocolate Silk pie or the real coconut on the Coconut Cream, Marie brings that homemade-with-love feel to the meal. The smell of the baking Dutch Apple pie wafts through the house promising a dinnertime filled with family, fun, and homemade yumminess. 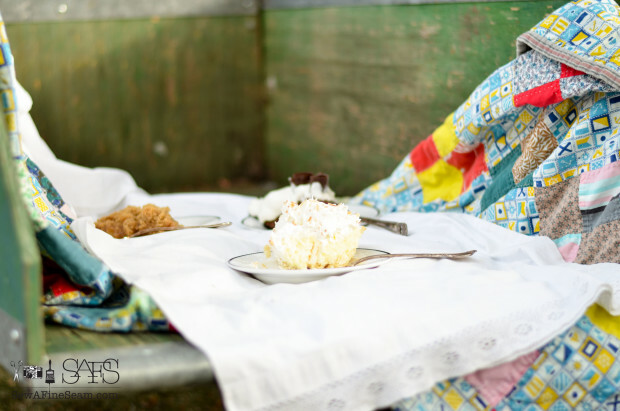 The Chocolate or Coconut pie sitting in the fridge tantalizes anyone who peeks inside before dinnertime. 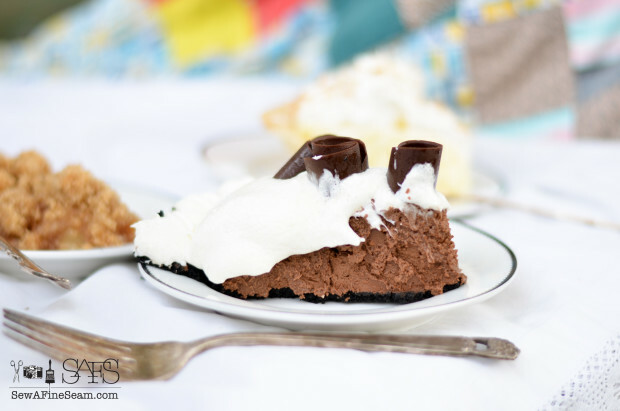 Marie Callender’s Chocolate Satin Pie has a rich chocolate filling – my teenager called it a mousse filling as she gleefully devoured it. She especially liked the real chocolate curls on top of the mounds of whipped cream. 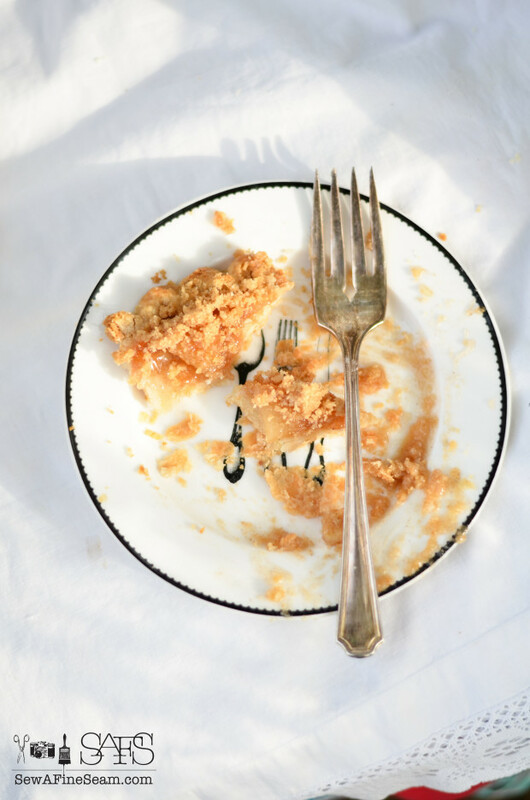 The Dutch Apple Pie has a brown sugar streusel crust that you add after the majority of the baking is done – crumb crusts are a favorite at our house. 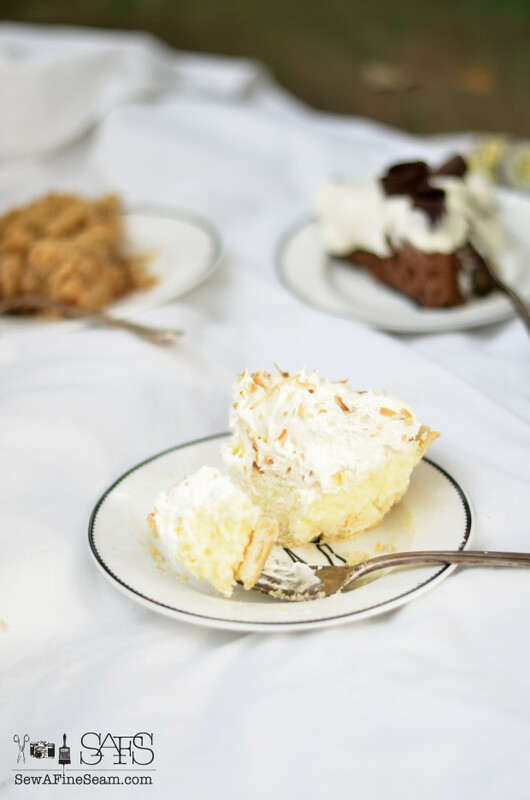 Real Toasted Coconut adorns the top of the Coconut Cream Pie. 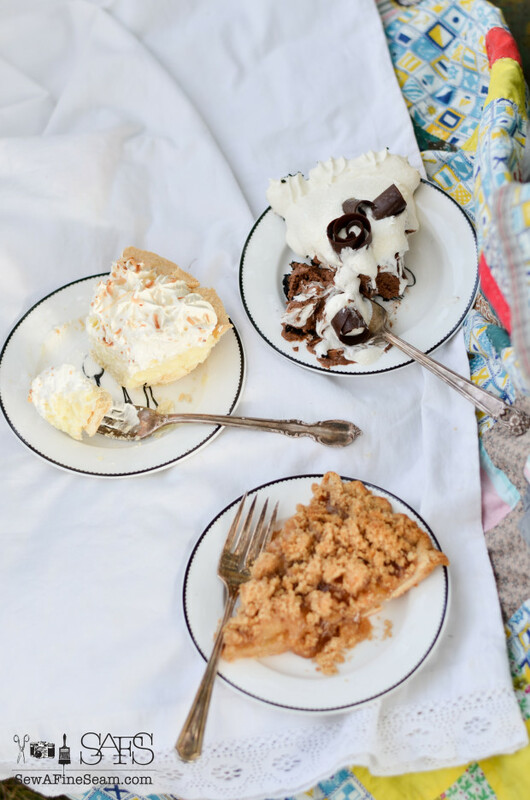 All 3 pies feature a made-from-scratch crust. The look on hubby’s face when he finds out you actually made dessert is worth the effort it took to pull that pie out of the freezer and pop it in the oven to bake (or the refrigerator to thaw depending on the kind you are having) 😀 Having a pie or two on hand in your freezer is a handy idea – that way you can celebrate any day you choose – just because. Celebrate life. Celebrate the opportunity to wake to a new day, to climb out of bed and grab your first cup of coffee (and perhaps a slice of that leftover pie 😉 ) and get the day going, see what we can create today. 9:45. Day is done. Girls are in bed, kitchen is clean (on a really organized day) and I’m relaxing a bit. To celebrate the day’s end I think I’ll share that last piece of Dutch Apple with my husband. (yawn) and then it’s time for bed. Tomorrow we do it all over again. And just maybe we’ll celebrate tomorrow too! 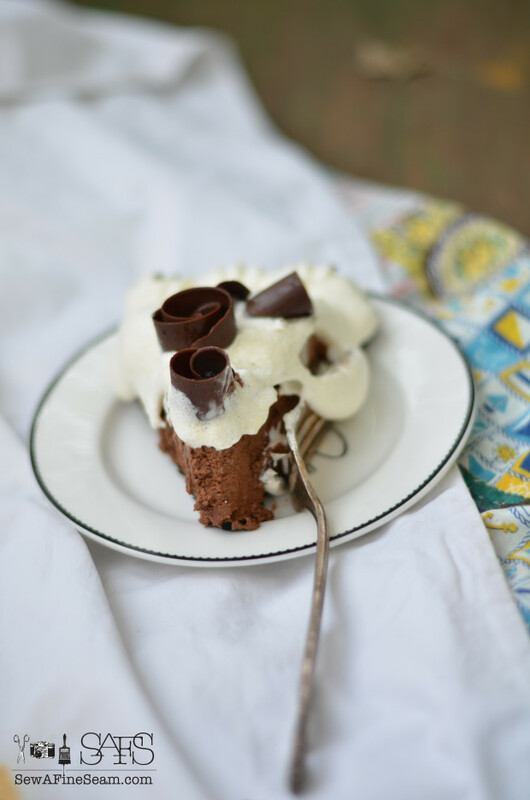 You can see more yummy desserts on Marie’s Pinterest Page and her Facebook page. 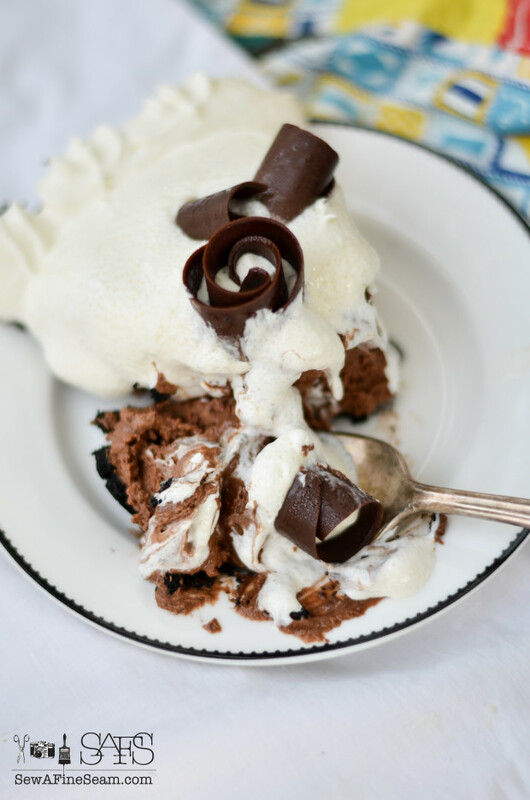 You will find more than desserts too so check it out – you just might find more great, homemade quality dishes to add to your meal plan! 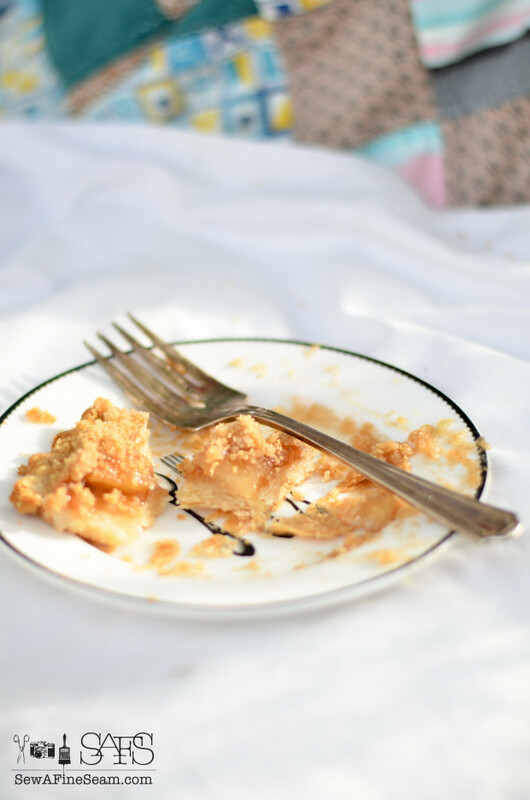 *this is a sponsored post in collaboration with blogher and Marie Callender’s Pies. 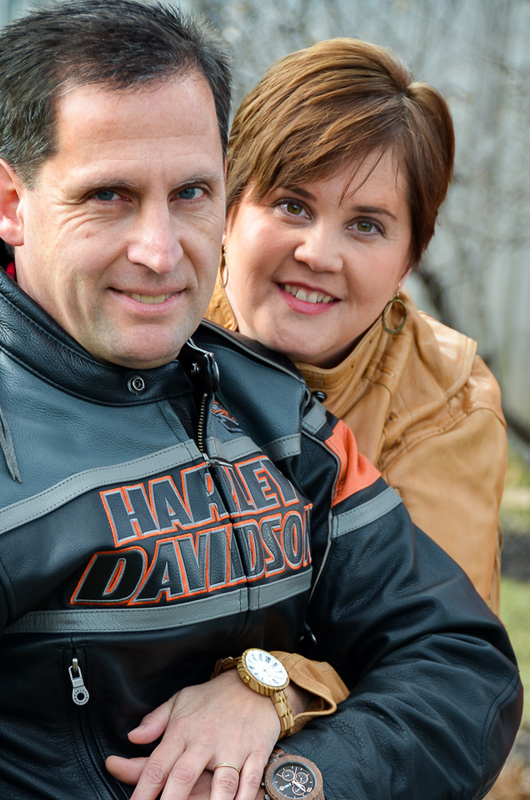 I was compensated for writing and posting this on my blog. All opinions are 100% my own. 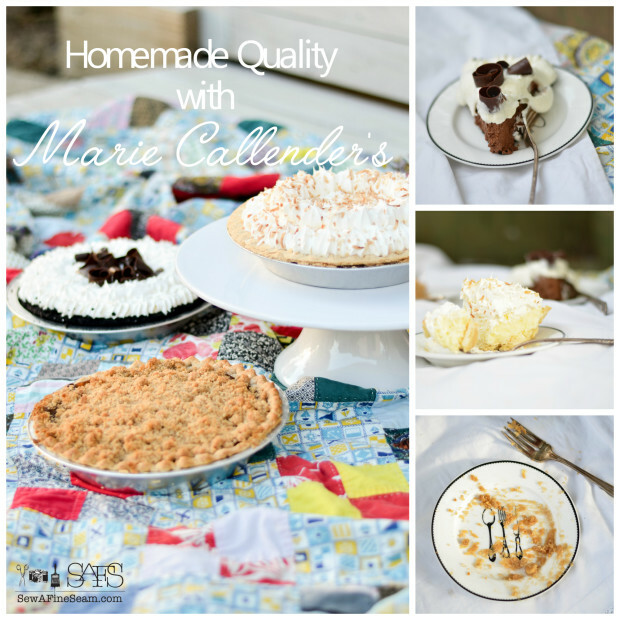 What can you celebrate with a Marie Callender pie today? Tell me in the comments for a chance to win a $100 Visa Gift Card. Sweepstakes: Entry Instructions: No duplicate comments. You may receive (2) total entries by selecting from the following entry methods: 1. Leave a comment in response to the sweepstakes prompt on this post 2. Tweet (public message) about this promotion; including exactly the following unique term in your tweet message: “#SweepstakesEntry”; and leave the URL to that tweet in a comment on this post 3. Blog about this promotion, including a disclosure that you are receiving a sweepstakes entry in exchange for writing the blog post, and leave the URL to that post in a comment on this post 4. For those with no Twitter or blog, read the official rules to learn about an alternate form of entry. This giveaway is open to US Residents age 18 or older (or nineteen (19) years of age or older in Alabama and Nebraska). Winners will be selected via random draw, and will be notified by e-mail. The notification email will come directly from BlogHer via the sweeps@blogher email address. You will have 2 business days to respond; otherwise a new winner will be selected. The Official Rules are available here. This sweepstakes runs from 11/23/2015 – 2/29/2016 Be sure to visit Marie Callender’s brand page on BlogHer.com where you can read other bloggers’ posts! I will take a yummy slice of Marie Callender’s chocolate! I love pies more than cakes and have found Marie Calendar’s to be the best. In fact for Thanksgiving I’m serving her Coconut Cream and Peach Pies. Marie’s pies have that home-made taste. I can celebrate the Thanksgiving and Holiday season with my family by having more time with my family by serving Marie Callender pies. 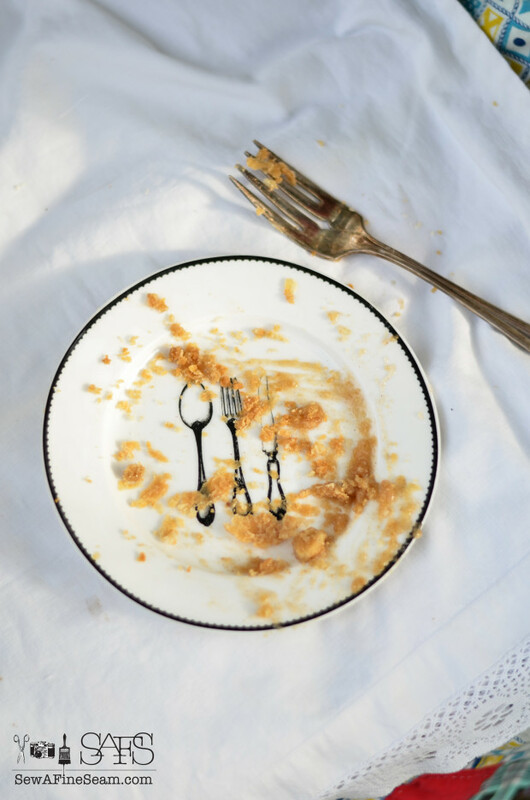 We just love the Dutch Apple Pie. It is our favorite! I can celebrate my kids having a few days home from school for Thanksgiving. Thanksgiving! Ordinary everyday! Having my sister and her family visit! I celebrate Thanksgiving with a Marie Callender pie today. I could eat the Marie berry, berry piesever day of the week. Pie is my all time favorite food and Marie Calendar pies are what I’m trying to re-create when I make a homemade pie. I love celebrating my birthday with s Marie Cslendar’s pie since I prefer it far more then cake!! Great post Jill!! I am proud to say that Thanksgiving coincided with my 39th wedding anniversary,so my sister-in-law brought the pumpkin pies, but I would celebrate being in love with my husband next weekend (after these pies are gone) with any of Marie Callender’s pies as they are all delicious!!! I can have a piece of pie with my BFF and celebrate 28 years of friendship!